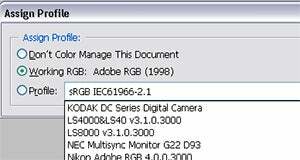 You can choose to attach a different ICC profile to an image by selecting the Edit > Assign Profile option in Photoshop. This feature lets you assign the chosen colour space to the picture without changing the value of the imageu2019s colours to the profile.rnIn contrast, the Convert to Profile option available from the same menu changes the colour values of the original image to match the newly selected colour space. 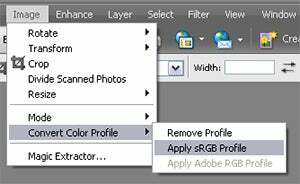 For Photoshop Elements users selecting one of the options in the Image > Convert Color Profile menu will convert the picture’s colour to the selected colour space. However, if you press Ctrl when selecting a new profile, it will apply the profile without converting. This gives the image the appearance that it has been converted but maintains the underlying colours of the original, which is the same as the Photoshop Assign Profile command. 01 As is the case for many image changes whenever possible it is worth ensuring that alterations are not permanent. In the field of colour management the Assign option is such a change. Unlike Convert to Profile, Assign Profile previews the colour change with the new profile but maintains the original numbers. 02 After selecting Edit > Assign Profile you are presented with a simple dialogue that gives you the option of assigning the working profile (set via the Color Settings in Photoshop), one selected from the Profile list or removing the profile all together (never recommended). Click OK to make the change. 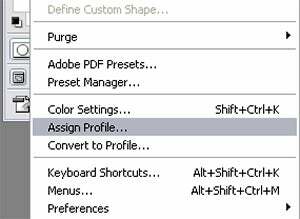 03 Photoshop Elements doesn’t provide a specific menu item for Assigning rather than Converting to a new Profile. Instead holding down the Ctrl/Cmd key whilst selecting the Image > Convert Color Profile option will switch the feature to an assign rather than conversion action.